Fig. 1. — Lighting a disconnected vacuum bulb of 1,500 candle power by high-frequency currents — Photograph taken by the light of the bulb itself, exposure about two seconds. Since the unfortunate accident of four years ago, which crippled and delayed my labors in a number of lines so seriously, I have had but little time to devote to the fulfillment of a duty which, next to that of turning his best efforts to diligent inquiry in the fields he has chosen, is the most important to a scientific man; namely, that of giving an exact record of the results obtained. I realize with sorrow every day that, despite of all pains taken to this end, I am gaining but very slowly on the material accumulated. Ideas come through a happy inspiration, apparently without much exertion, but it is the working out of the many harassing details and putting into a presentable form which consumes time and energy. It was impossible to abandon research in new directions, in which I have felt myself irresistibly drawn, and it was equally impossible to do full justice to the work partially completed, and I can only hope to gradually retrieve my losses by the only expedient available, which is to redouble the zeal. It is not the best plan to follow, I confess, and is in radical opposition to the kindly advice given to me to the effect that I intended to live 200 years by sleeping most of the time! It may also show that it is not this mode of life which is responsible for the delay in the commercial introduction of my system of vacuum tube lighting, as has been asserted by some people who have found a singular satisfaction in dwelling extensively in their columns on my proposed glass house on Long Island, which was to cover acres of ground, and which was to be built for the purpose of catching the sun’s rays; on my claims of the discoveries of Roentgen; on my invention enabling me to move and explode torpedo boats by will power, and on my efforts to annihilate the entire British navy. It is to be hoped that the limit of patience of the readers has been finally reached. Fig. 2. 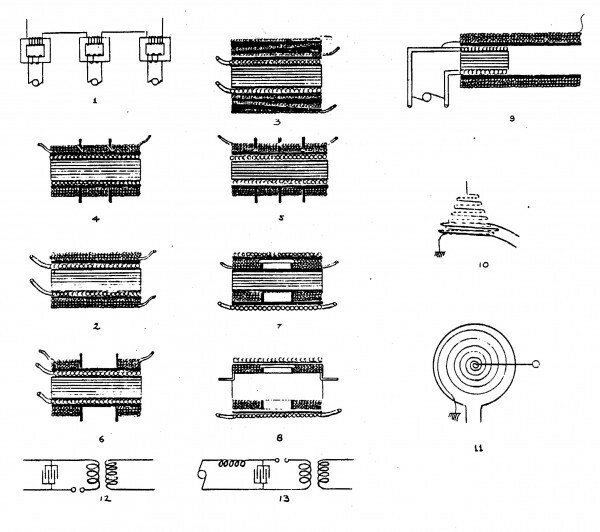 — Table of diagrams illustrating the evolution of a high-tension transformer enabling the production of electro-motive forces of many millions of volts. Fig. 3. 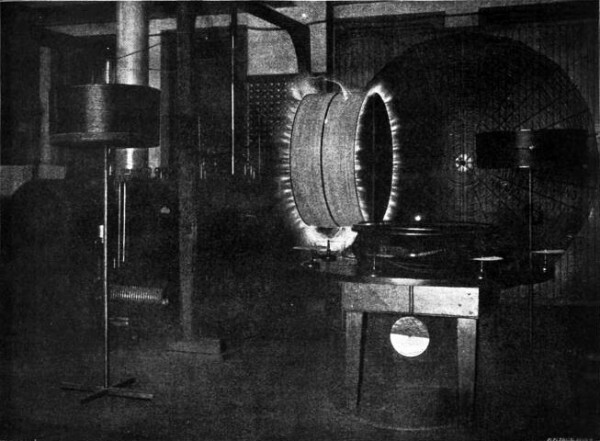 — Photograph showing a part of the laboratory, with a disconnected resonating coil supported on an insulating stand, and illuminated by the streamers produced, other coils remaining unaffected — The pressure developed in the resonating coil is over half a million volts. It was chiefly in three directions that electrical investigation was attractive and promising: There were the excessive electrical pressures of millions of volts, which opened up wonderful possibilities if producible in practical ways; there were currents of many hundreds of thousands of amperes, which appealed to the imagination by their astonishing effects, and, most interesting and inviting of all, there were the powerful electrical vibrations with their mysterious actions at a distance. What better work could one do than inventing methods and devising means for enabling scientific men to push investigation far out into these practically unknown regions? This work was difficult and tedious and involved a certain amount of material sacrifice, but promised a higher reward if successfully accomplished — the gratitude of those many who exercise their gifts in different directions and are compelled to rely on the expert for providing them with implements suitable for their special purpose. Who can estimate how much science has been advanced by the beautiful instruments of measure which Lord Kelvin has given us? Unfortunately, in many of the new fields such instruments are yet to be invented. Still more unfortunately, informations seems to be more needful than instruments, if one is to judge from statements frequently made in technical periodicals on a variety of subjects. An experimenter, for instance, measures the current through a make-and-break device, and, finding it small, he infers that the conversion is economical. Another suggests to determine the efficiency of conversion through such a device by the calorimetric method. Now, as a matter of fact, if there was such a contrivance, absolutely perfect in its action, which would behave as I have explained on another occasion, and change the resistance of a gap from zero to infinity without any loss in the gap itself, which separates the terminals, it still might happen that 99 per cent of the energy supplied to the circuit would be wasted in radiations, useless for the purpose contemplated. The calorimetric method would in this, or generally in any other instance, in which the disturbances produced are very sudden, entirely fail in giving an approximation as to the energy dissipated in the circuit, for the simple reason that the friction encountered by a wave in its passage through a medium, which determines the amount of heat generated, is no measure whatever of the energy of the wave. Thus, certain well understood cases excepted, the only method at present available in such estimates is to take account of the energy consumed by the source of supply. This remark alone will show that the economical conversion of currents by make and break devices is a much more difficult problem than it appears to those who have studied it superficially. Not only must the devices used in the transformation possess certain characteristics, but the entire circuit must be properly designed. One can not help admiring the confidence and self-possession of experimenters, who put forth carelessly such views and who, with but a few days’, not to say hours’, experience with a device, apparently unmindful of the responsibility of such a step, and advance their imperfect results and opinions hastily formed. The sparks may be long and brilliant, the display interesting to witness, and the audience may be delighted, but one must doubt the value of such demonstrations. There is so little novelty in them, that one might easily perform a practical joke on the lecturer by describing in advance all his drawings, apparatus, experiments and theories, this placing him in an awful predicament. Though such a course would be naturally impolite, it might be found justified and excused by the circumstances, for premature expressions of opinion and demonstrations of this kind are responsible for much evil, one of these being the erroneous idea which they create in scientific circles as to the importance of an advance made. It grieves one to observed that, for example, such great work as that of Professor Dewar, which he turns out with clock regularity, is scarcely commented upon in the technical columns, whereas a worthless trap for interrupting currents, which usually consumes nine-tenths of the energy, and is, besides, useless for other reasons, and just suitable for the amusement of small boys, who are beginning their electrical experience with Leclanche batteries and $1.50 induction coils, is hailed as an important scientific discovery. An agreeable contrast is afforded by those who patiently investigate, contented to lose the credit for advances made rather than to present them to the world in an imperfect state, who form their opinions conscientiously, after a long and careful study, and have little to correct afterward. Fig. 4. 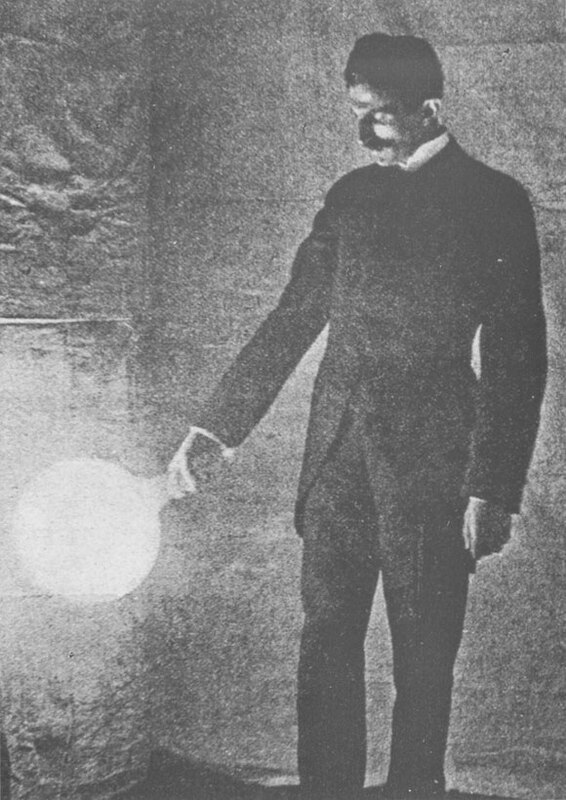 — Photograph showing an incandescent lamp lighted by a synchronized circuit composed of a wire loop and condenser, and energized by waves transmitted from a distance. The importance of the task of providing proper implements for research in these fields once recognized, it became the question in what line the efforts to this end would be likely to be most profitable. A little thought showed that it was in investigating high electrical pressures, for these were needed in most instances. More than a passing thought was given to static electricity, with the experiments of Franklin as starting point. Various forms of generators of static electricity were experimented upon, and some new ones designed, to which I hope to revert some time, as they present some features of interest. The most valuable outcome of these experiments was a method of conversion which I have described, and which enables the operation of any kind of devices of low tension from such a high-pressure source with perfect ease and safety, no matter how high the tension. Soon, however, it was recognized that with the above object in view generators of steady pressure were entirely impractical, quite apart from their incidental limitations. It was exactly as if one attempted to drive piles into the ground by the application of continuous pressure. This would require cumbersome and powerful machinery, and would be very inconvenient. An incomparably better way of developing high pressure is by delivering violent blows as with a hammer. In such a case the motion of the hammer being suddenly arrested pressure is developed on the point of impact, which is all the greater the smaller the displacement caused, and if there were material absolutely rigid, incompressible and inelastic, an infinite pressure might thus be developed by a small blow. Hence one is forcibly driven to the use of a transformer or induction coil as means for producing great electrical pressures. 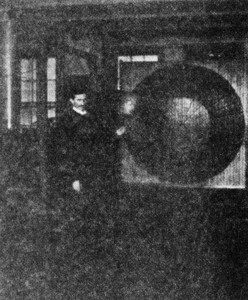 The first difficulty encountered was that of insulation, and it might be interesting and useful to show, chiefly to those who are less familiar with this special subject, how by gradual improvement, from the ordinary inductorium capable of furnishing currents of very moderate electro-motive force, an apparatus was finally evolved in which there is practically no limit as to the pressure obtainable. Fig. 5. 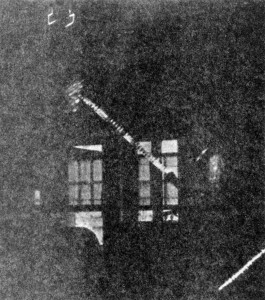 — Photograph showing an incandescent lamp lighted by means of waves transmitted through space to a coil without a condenser. Selecting first the closed core transformer, one easily recognizes that it is unsuitable for the attainment of the object in view for obvious reasons. Nevertheless, by adopting the plan illustrated in the first diagram of Fig. 2, I succeeded in obtaining nearly 200,000 volts, and I think that more than twice this tension is practicable by means of such an arrangement, which involves the use of independent and entirely insulated sources of supplying the primaries, as will be understood from an inspection of the diagram without further explanation. The evident limitations of the closed-core type in the way of insulation, rate of change and frequency of the current impulses, led to the adoption of an open-core type, as a matter of course, and the various diagrams of the figure referred to illustrate the modifications as they were gradually made in the manner of insulating and winding of the coils. In diagram 2 the old, primitive method of insulation is indicated. In diagram 3 the succeeding layers are insulated by material increasing in thickness gradually from one end to the other, being thickest on the place of greatest difference of potential. The thickness is easily calculated beforehand, and is such that all the insulation is as nearly as possible uniformly strained. As it was impracticable to pile up many layers in the manner illustrated in diagram 3, naturally the modification illustrated in diagram 4 was made, which led to a further improvement; indicated in diagram 5. It was recognized, however, that there was no advantage in winding many coils, and that all that was needed were two secondary coils joined in the middle, as illustrated in diagram 6, the secondaries being, of course, wound as shown in diagram 3. Next, in order to increase the output of the coil and gain other advantages, the relative customary position of the primary and secondary windings was reversed and the coil as shown in diagram 7 produced, the two secondary coils being joined on their outer, instead of on their inner ends, as before. This construction was considerably better than that illustrated in diagram 6, as the primary and secondary coils were placed in closer inductive relation. But when with this coil the tension had been pushed far enough, it was found that the iron core limited the spark length, and then two insulated cores, one in each coil, were resorted to, which were finally discarded, and so the coil shown in diagram 8 resulted, which I have described on several occasions and which, of all other constructions, permits the obtainment of the highest possible tension with a two-terminal coil in a given space. Fig. 6. — Experiment illustrating the action of a synchronized circuit energized by waves transmitted from a distant oscillator — The energy received is transferred upon another unresponsive circuit, lighting the incandescent lamp attached to the same. But even in this perfected type it was not possible to go beyond a certain potential difference, and a further investigation led to a new type, which I have called a single terminal coil, and which is illustrated in diagram 9 and is now well known. In this coil the adjustment is so made that the secondary is nearly equal to the quarter of the wave length, the highest potential being, under these conditions, produced on the free terminal. Subsequently I extended such adjustment also to the coils in diagram 8, improving the same materially. 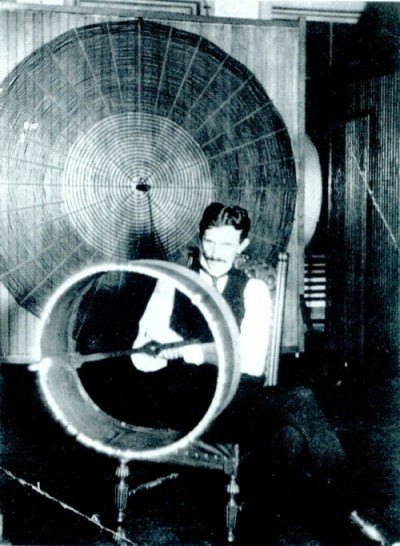 During these efforts I fortunately discovered the important part which air played in the breaking down of the insulation, and by adopting proper methods for the exclusion of gaseous matter, I was able to increase the electro-motive force to more than 10 times the value without breaking down the secondary. I have described this method since, which I am using in the manufacture of coils and condensers, and without which it would be entirely impossible to reach any such results as I have obtained. The industrial world has profited by the recognition of the action of the air, for it has helped to extend power transmission to greater distances than heretofore practicable. It has also been useful in determining the limits of the electro-motive forces with ordinary apparatus used in power transmission, but I see that no attempt is yet made to overcome the streamers by a suitable construction of the cables, as I have indicated, and thus make higher electro-motive forces available. Fig. 7. 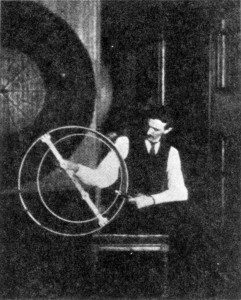 — Experiment showing a coil energized by the waves of a distant oscillator and adjusted to the capacity of the body of the operator, who preserves himself from injury by maintaining a position at the nodal point, where the intense vibration is little felt — The pressure on the end of the coil towards the reader, which is illuminated by the powerful streamers, is nearly half a million volts. Further experimentation with the original single-terminal coil, before referred to, finally led step by step to the adoption of a coil of large dimensions, which, in two typical forms, is illustrated in diagrams 10 and 11. With such a coil I found that there was practically no limit to the tension available, and it is by its means that I discovered the most important of all facts arrived at in the course of my investigation in these fields. One of these was that atmospheric air, though ordinarily a perfect insulator, conducted freely the currents of immense electromotive force producible by such coils and suitable accessories. So great is the conductivity of the air, that the discharge issuing from a single terminal behaves as if the atmosphere were rarefied. Another fact is that this conductivity increases very rapidly with rarefaction of the atmosphere and augmentation of the electrical pressure, to such an extent that at barometric pressures which permit of no transit of ordinary currents, those generated by such a coil pass with great freedom through the air as through a copper wire. Following up these promising revelations I demonstrated conclusively by experiments that great amounts of electrical energy can be transmitted to any distance through upper air strata which are easily accessible, and since this truth has been recognized every fiber has been strained to realize such a transmission on a large scale. These two observations explain clearly the silent discharges noted frequently in dense air strata, but three or four miles above the earth’s surface. One more equally important fact I may mention, which was simultaneously observed. The discharges of such a coil, when of an electro-motive force of a few millions of volts, excite powerful affinities in the atmospheric nitrogen, causing it to combine readily with the oxygen and other elements, particularly in the presence of aqueous vapor. So energetic are these actions and so strangely do such powerful discharges behave, that I have often experienced a fear that the atmosphere might be ignited, a terrible possibility, which Sir William Crookes, with his piercing intellect, has already considered. Who knows but such a calamity is possible? And who can tell with certitude that periodical cessations of organic life on the globe might not be caused by ignition of the air and destruction of its life-sustaining qualities, accidentally or as a consequence of some accumulative change? A lump of coal will lie for centuries unaffected in contact with oxygen, but the combustion once started, the process continues as long as there are elements to combine. Fig. 8. 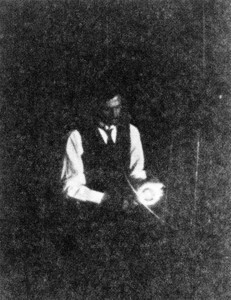 — Photograph of the experimenter standing in the middle of the laboratory and lighting a vacuum bulb by waves from a distant oscillator — His body is, in this case, subjected to great electrical pressure. While improving the construction of the transformers, every effort was made to perfect the apparatus for generating the currents. The objective point from the outset was to obtain the greatest possible rate of variation. High-frequency alternators were first used, but their limitations were soon apparent. I then turned again and again to make and break devices, chiefly with the object of using them in connection with a novel form of transformer, which I have previously described, and which is now well known and understood. In its original form, as I first showed it, it is illustrated in diagram 12, which need not be dwelt upon, beyond saying that one of the characteristic features of such an instrument is the energizing of the primary of the induction coil by the rapidly succeeding discharges of a condenser. In a more recent type, specially adapted for ordinary supply circuits, which I have described and shown before several scientific societies, the transformer comprises, as indicated in diagram 13, three coils, there being, in addition to the primary and secondary coils, one which receives the currents from the supply circuit, and is designated the charging coil. Preferably the latter is not in inductive relation with the former. On a number of occasions I have described high-frequency apparatus embodying this beautiful method, which has already been of great value to science in my hands as well as in those of others. But a defect, to which I called attention early, still confronted me. It lay in the make and break devices which performed the function of charging and discharging the condenser. Fig. 9. 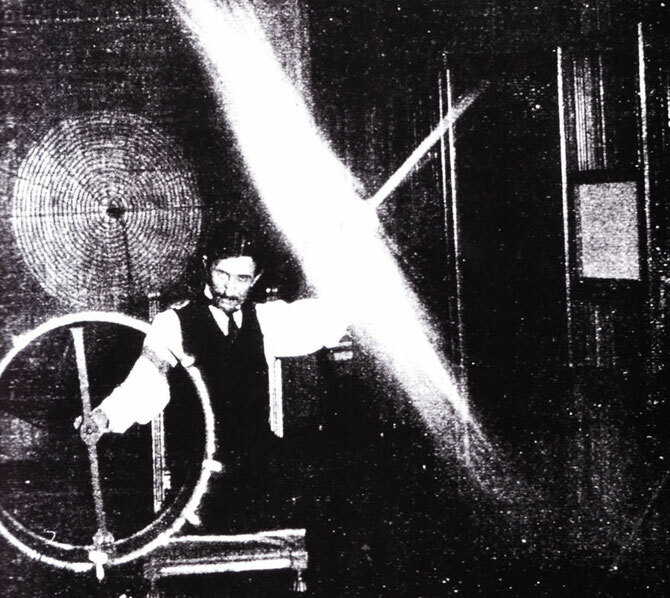 — The operator's body, in this experiment, is charged to a high potential by means of a coil responsive to the waves transmitted to it from a distant oscillator, and a long glass tube waved in the hand is lighted to great brilliance by the electrical charges conveyed to it through the body. Many of such devices, based on a variety of principles, formed the subject of experiments carried on with the aim of doing away with this imperfection. To cite one of these, the current from the source of supply was passed through a minute column of conducting liquid maintained in a variety of ways, and in this simple manner rapidly succeeding impulses were obtained. Incidentally, some useful results were secured with these contrivances, as, for example, the generation of currents of differing phase and the production of rotating fields moving with constant velocity; but, interesting as these simple devices were, they naturally precluded the possibility of economical conversion. Their study, however, was useful as a means of recognizing the requirements of such make and break apparatus, and, finally, led to forms based on scientific and economical principles. A number of these were recently described in technical periodicals and, as stated on a former occasion, they fulfill their difficult duty surprisingly well and make it possible to obtain currents of very high frequency from ordinary supply circuits with great economy. These novel contrivances lend themselves well also to the uses of the ordinary induction coil, and I have employed them with equal success in a form of Plante’s rheostatic machine and for many other useful purposes. Thus, after a continuous effort extending through a number of years, I have the supreme satisfaction of having carried this hard and important task to a satisfactory end. Fig. 10. 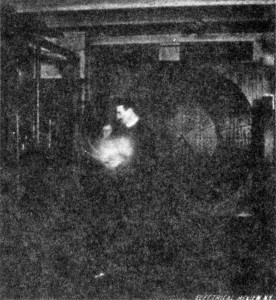 — In this experiment the operator's body is charged to a great pressure by a direct connection with an oscillator — The photograph shows a sheet of tin of determined size, held in hand — The operator is on the top of a stationary electrical wave, and the bar and sheet are both illuminated by the violently agitated air surrounding them — One of the vacuum tubes glows brightly, being affected by the vibrations transmitted to it from the operator's body. The annexed photographs will serve to convey an idea of what can be done with these perfected implements. Referring to Fig. 1, illustrative of the high rate of change obtained in the current, a vacuum bulb of about 12 inches in diameter is held in front of a coil of four turns of specially constructed heavy cable, through which a condenser is discharging, and, although at a distance of several inches from the coil, the gas in the bulb is brought to intense incandescence, the light emitted being fully equal to 1,500 candles. Such a powerfully energized coil, when the frequency, as in this instance, is measured in millions per second, shows little repellent action, but when the frequency of the impulses is low, closed conductors, as washers of conducting material, are thrown off with a force of a magnitude which can be only explained on the assumption that the currents have maximum values of many hundred thousand amperes. The remaining photographs will be understood from the titles, which are made explicit for this purpose. I hope to have in the near future an opportunity for describing more of such experiments, and dwelling in detail on the apparatus used. For the present I am compelled, for want of time, to merely sate that the vibrations used in most of them were from 400,000 to 800,000 per second. Fig. 11. 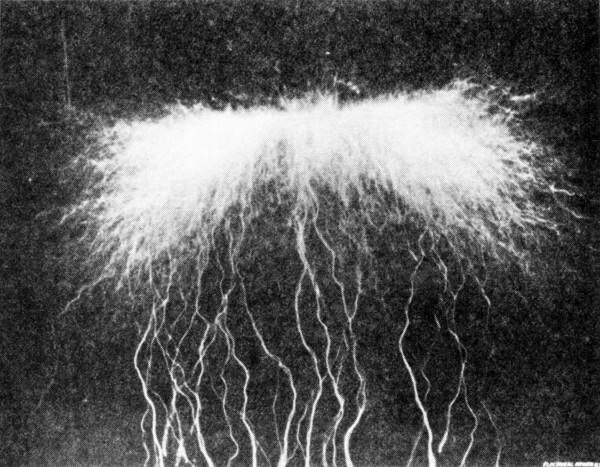 — Photograph of an active terminal of an improved oscillator, used in tesla's experiments for transmitting electrical energy to great distances without wires — Width of illuminated space is 18 feet — The pressure on the terminal is about eight million volts. In conclusion I wish to apologize for the frequent appearance of my likeness in these photographs, which is distasteful to me, but was unavoidable. Most of the advances indicated, and a number of others, have resulted from the application of the beautiful principle upon which the operation of this apparatus is based. Scientific men have honored me by identifying it with my name, and I have earnestly endeavored to show myself worthier of this great distinction by devoting to it much of my energies. No desire for material advantages has animated me in all this work, though I hope, for the sake of the continuance of my labors, that these will soon follow, naturally, as a compensation for valuable services rendered to science and industry. To the scientific experts, who are familiar, in theory and experiment, with electrical vibrations, the results here shown will, I believe, speak in eloquent language. But those readers to whom they are naturally less intelligible will ask: What are they good for, and what do they or have they demonstrated? To them it may be said that they have shown and proved among many other things: That ordinary currents can be transformed with high economy into electrical vibrations of any pitch, which are needed in many novel arts; they have shown that electrical energy in great amounts can be efficiently and safely transmitted without the use of wires to any point of the globe, however distant; they have furnished proof that the movements and operation of bodies and machinery carried by the same can be controlled from a great distance without any tangible connection whatever and with absolute precision; they have proved the practicability of a system of signaling without wires, not with the imperfect appliances as before attempted, which can not be tuned and are rendered useless by the play of a small induction coil, but by means of apparatus producing powerful oscillations and circuits in exact synchronism, with which it is impossible to interfere; they have shown that atmospheric nitrogen can be readily combined and valuable products manufactured, merely by the application of cheap water power, and that light, diffusive like that of the sun, can be produced with an economy greater than obtainable in the usual ways and with lamps that never consume.